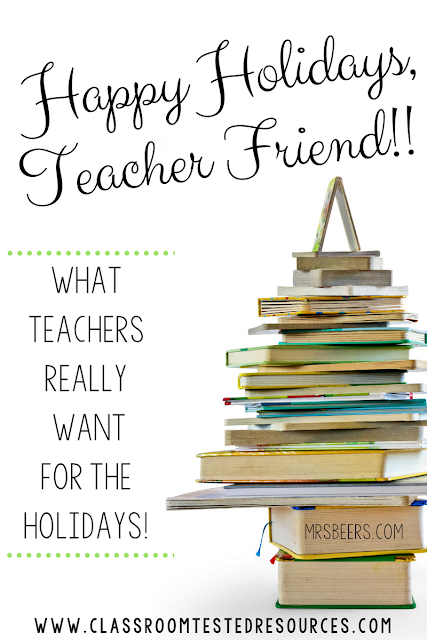 What Teachers REALLY Want for the Holidays...& a FREEBIE! As a teacher-mom, I can feel overstretched when it comes to the holidays. 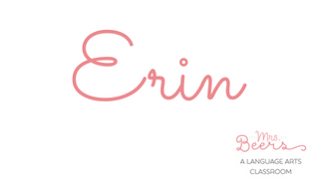 While I adore celebrating birthdays and holidays with my students, family, and friends, finding the PERFECT gifts can get both expensive and overwhelming. A school bag with graded papers that have already been entered into the grade book. When the copier is working. Students that include part of the question in their answers. Student names on EVERY paper. Recess duty on a sunny day! Clearly, I am not hard to please! You can be honest, those are a few of your favorite things too, right?! We are teachers, joy comes easily...we are appreciative for sharpened pencils, glue sticks with caps, markers that haven't dried out, and jeans on Fridays. So this year, instead of scouring the shelves of Target or Pinteresting until my brain is ready to explode, I have decided to gift my teacher pals with things that don't come from store shelves, in bottles with corks, or in orderly six-packs! 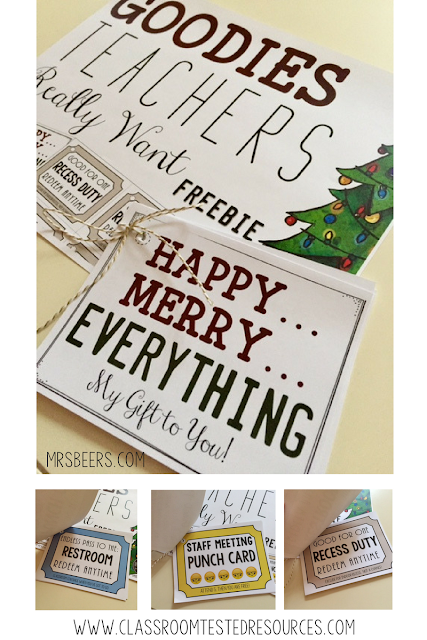 Instead, I decided to create a sensible gift that can benefit my teacher comrades for months to come...a Happy, Merry Everything Gift Book! Your school amigos will LOVE that you "get" them and understand the little gestures that make each day just a little bit easier. This little "gift book" includes everything from covering recess duty and bus duty, to allowing for some much needed teacher venting. Best of luck as you tackle these WILD weeks before the break with your students. I appreciate all you do and your students are lucky to have you! I would LOVE to hear about your favorite festive finds and the teacher gifts that have brought you the most joy. Happiest Holidays!